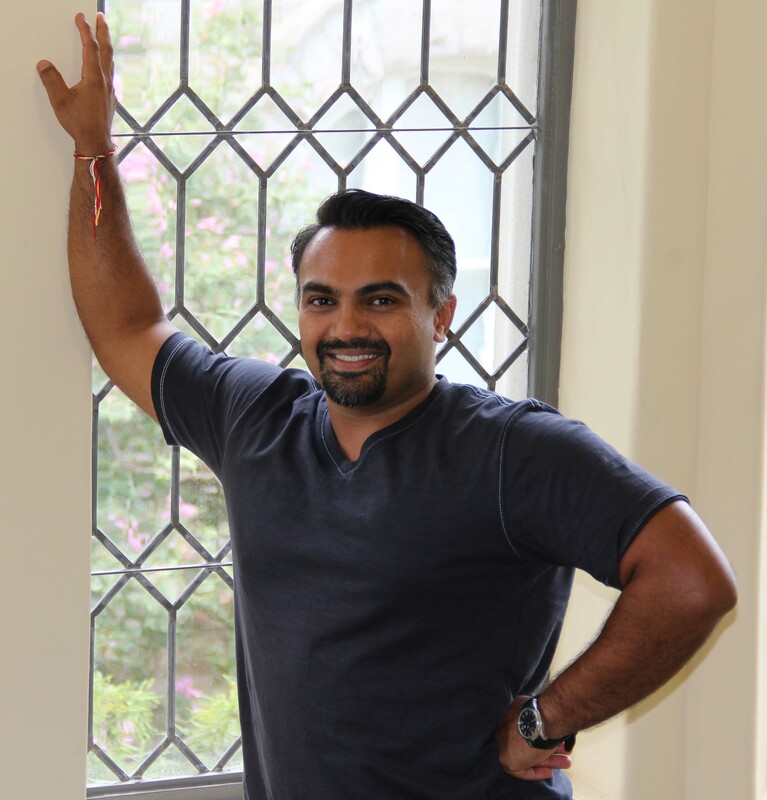 This week’s post features an interview with Jayur Mehta who is completing his doctoral studies at Tulane University in New Orleans. His dissertation work focuses on the Carson Mound group near Clarksdale, Mississippi. I first met Jayur several years ago when he was employed at the Mississippi Department of Archives and History. I have followed his blog for the past several years and found his most recent post on community outreach and service learning in his field work to be quite interesting. Jayur’s work is an excellent example of using the college classroom as an opportunity for students to employ an applied archaeology approach to community and cultural heritage development. Below is an interview with Jayur where he touches on these issues. Please tell us a bit about your background and how you became interested in community outreach? My entire archaeological career was born out of community outreach. When I was 16 years old, I was fortunate enough to participate in an East Carolina University sponsored summer camp, and during that camp, we spent 2 weeks digging at Fort Neoheroka, a Tuscarora village and stronghold built in the early 18th century. This experience fundamentally played a role in my life and career, and I would not be an archaeologist today if it were not for the East Carolina University archaeology summer program. I did not get the opportunity to engage in any community outreach until I was in my mid-20s and working for Mississippi Department of Archives and History (MDAH). It started with short public lectures at small, rural libraries, and my outreach efforts culminated at MDAH in a day-long archaeology fair/expo I helped to organize. How do you integrate community outreach in your archeological or cultural heritage projects? I work with community partners who are local to where I do my research. In trying to figure out how best to “do” community outreach, I realized I needed to know people in the community and what their needs actually were. I was introduced to some of the leaders of the Griot Youth Program, a non-profit dedicated to arts education, and we quickly developed a rapport that allowed us to collaborative decide how best to bring their high-school aged students together with my college students to not only learn archaeology, but also to make garden boxes and assist with the Griot summer programming. What is the reaction to your University students who participate in public outreach projects as part of their field season. Most of my students have really enjoyed doing service projects, whether for archaeology or environmental studies. In our post-service reflection sessions, I have noticed that students like talking and collaborating with other students who are older or younger, and they enjoy sharing information they have learned. Occasionally I’ll get the recalcitrant student but, in general, they are eager to participate in activities that are outside of the classroom and relevant to the content of the course. I think this is the most important element of outreach and service learning – any and all activities should be related to the mission statement of the course. How has your public outreach evolved over the past few years? My public outreach was initially formulated while working for a state agency, not as a college professor, so my early outreach efforts entailed speaking with an incredibly broad public audience. Whether in lectures, artifact “show and tells”, or in archaeology fairs, archaeology was the focus. Now however, I teach archaeology and environmental studies to students, and my outreach efforts are focused on bringing students into contact with communities and community partners. It has been an exciting shift in focus – I like working with a specific and captive population and tailoring my pedagogy to their needs, which I can predictably anticipate because of our daily classroom interactions. What do you consider your most successful recent efforts in public outreach or community engagement? I can think one very successful and recent outreach event. Last summer, one of my students from the field school became particularly enamored of the Griot Youth Program and wanted to do something good for them. Given they are an arts focused non-profit, he wanted to help them with their programming infrastructure. When he approached me after the class and said he wanted to do something for them, I helped with identifying grants he could write for the Griot Youth Program. Unfortunately, these proved to be too time consuming. This turned out to be a blessing in disguise – instead, my student and I organized a fund-raising concert that provided enough funds for the Griot Youth Program to buy a new PA system. While this service work was not directly related to the course, my student met these partners through the course and he identified his own path to helping my community partners. I think he did a lot of good here, and I’m very proud of his efforts! What are some of the biggest lessons you have learned from your educational and outreach program? In general, I think it is that small groups work the best, regardless of the kinds of activities taking place. I like giving one on one attention to folks or at the least, engaging with them in small groups. Lecture is a great way to target a large group of individuals but lectures are only so stimulating. This brings me to my other point, which is that outreach, education, and service do not happen in a vacuum. You need people at your side helping with outreach and service and you need partners to participate and help guide your outreach work. Ideally, outreach and service are reciprocal between community and educator – for this collaboration to be effective, good working friendships are important. What do you consider to be the biggest obstacle in developing effective educational outreach? At the end of the day, outreach and service learning should not just be an “extension” of the fields in which we operate. Instead, service should be a fundamental component by which lessons are taught. This is very difficult to implement and requires a fair bit of planning and hard work. Sometimes, and I feel this often, it is easier to lecture or to teach concepts outside of a community-oriented context. The challenge is to make yourself, and your students, care about the well-being of communities in which they living. The idea of working on development projects with the host community that are not related to immediate research interests seems somewhat of a recent development for archaeologists. What got you interested in adding this component? While the arts programming that is the focus of the Griot Youth Program is not necessarily related to archaeology, I think it is related to the overall mission of academia and of the liberal arts, which is to provide individuals with the necessary tools to build a future, to help others, and to have a complex and historical understanding of human society. By working with underprivileged youth in the Mississippi Delta, my students learn about another sector of society and become familiar with the needs and wants of humans they may never otherwise encounter. These meetings and relationships are important if scholars and academics are going to effectively work towards building a more verdant and equitable future for all of society. I do service and outreach in my classes because I want students and communities-in-need to get together and to collaboratively find solutions to problems, whatever they may be. In the end, I want my students to know that the world and its problems are in their hands and that they have to find ways to address them. I want them to be citizens and active agents of equity. I believe through service and outreach, I am helping to put them on this path. Do you have any words of wisdom for archaeological and museum professionals to enhance their outreach work? Talk! Always engage with strangers about your work and make friends in your community. I decided that service learning and outreach would be important in Clarksdale because I was tired of going there every summer and making random friends in bars, only to forget them by next summer. If archaeological heritage is to be preserved and cared for, it is up to us not only to do the research, but also to help others understand why a mound, creek bed, or field are important cultural resources that should be preserved. Last week I participated in a forum about professional archaeologists working with “amateur” or “avocational” archaeologists. The session, “Cons or Pros: Should Archaeologists Collaborate with Responsible Collectors?” was organized by Michael Shott and Bonnie Pitblado at the Society for American Archaeology meetings held in San Francisco. In their introductory comments at the session both organizers emphasized the need for a cordial and respectful discussion, perhaps anticipating a polarized response to the question. This concern reflects a comment made by a professor of mine in graduate school who stated “There is no such thing as an amateur archaeologist. Would you go to an amateur brain surgeon?” To which my immediate response at the time and today is something like – Give me a break! The session organized by Michael and Bonnie went off without a hitch. Solid and important questions were raised such as the ethics of working with collectors who obtained their materials through legal but less than desirable circumstances and the problem of repositories bursting at the seams with cultural materials mitigating against taking on more artifacts, regardless of context (see excellent comments by Robert Janes on this issue). But all participants in the session noted the important role that “amateur” archaeologists played over the years and recognized the need to fully embrace and acknowledge that contribution today. A quote I have referenced several times over the years in this blog was from my first field school instructor, the late Dr. Patricia Essenpreis who said something like “If you cannot explain to the public why they should be funding this site museum and excavations, then you might as well go home.” Pat’s comment flowed from her belief in the need for accountability in research on public lands and in recognition that almost all archaeology, whether through CRM, private foundation, or outright public financing, ultimately is funded through tax dollars paid, or not paid in the case of charitable contributions. I published an article a couple of years ago on the surface collections from the Poverty Point site. The majority of the collection was made by Carl Alexander, an avocational/amateur archaeologist. Carl recorded the ridge and sector of the artifacts he collected over a 30-year period when the site remained in row crop, prior to purchase by the State of Louisiana in the early 1970s. In 2014 Poverty Point was designated a World Heritage Site. Today, Carl Alexander’s surface collections account for at least half of what we know about the material culture of the site. Interpretations based on his collections continue to be instrumental in guiding today’s professional research efforts. During my tenure as the Station Archaeologist at the Poverty Point site I gave archaeology month presentations at the public library in Belzoni, Mississippi, just down the road from the Poverty Point culture Jaketown site. The first year I spoke in Belzoni I talked about the spatial distribution of artifact types noted by Carl Alexander at the Poverty Point site. I asked the farmers in attendance if they noted similar patterns where different types of artifacts were recovered at Jaketown. Heads nodded. The second year I spoke in Belzoni, the same farmers talked about the artifact distributions they noted over the previous year. Today, there is a small museum in Belzoni composed of collections donated by those farmers. I first ran into Jerry Pankow sometime in the early 2000s. He had come to the Poverty Point site to discuss his “amateur” archaeology excavations at the Poverty Point culture Claiborne site in Hancock County Mississippi. Jerry and members of the Mississippi Archaeological Association diligently conducted excavations at this major Poverty Point culture site as bulldozers destroyed the site for a construction project. Jerry showed me his detailed field notes of 5 x 5 ft. units excavated through midden deposits at the site. He recorded cultural materials in arbitrary 5-inch levels, providing an excellent stratigraphic profile on stylistic and material culture change through time – a point of critical importance interpretively for the Poverty Point culture. In fact, these temporal markers were first documented by another avocational archaeologist, Clarence Webb, a pediatrician from Shreveport, Louisiana. When I first met Jerry he wanted to publish his notes. Jerry was quite insistent on how the material should be published and could not come to an agreement with any of the regional journals. He self-published a brief 35 page xeroxed pamphlet. While preparing my comments for the 2015 SAA meeting session, I discovered that in 2014, Jerry had expanded the original publication to double the length, again self-published but now available through amazon.com. I got a copy and am impressed. I am hopeful of getting hold of Jerry to convince him to publish his tabular data. First, the contributions of avocational/amateur archaeologists for understanding the Poverty Point culture of the Southeast is a critically important part of the total corpus of knowledge that exists about that prehistoric culture today. Second, concerns over looting of archaeological resources, the commodification of this country’s cultural heritage, and a lack of public funding for archaeological research are all concerns expressed by the professional archaeological community. We are well-served to embrace the avocational community who have a proven track record and can develop the grass-roots support to address these issues. Third, the premier professional archaeological organization in the U.S. is the SAA – the Society for American Archaeology, not the Society for Americana Archaeologists. In noting this distinction we are reminded that the interests of the discipline are appropriately placed before the self-interest of the practitioners. The latest issue of the Society for American Archaeology‘s (SAA) Archaeological Record Volume 15, No. 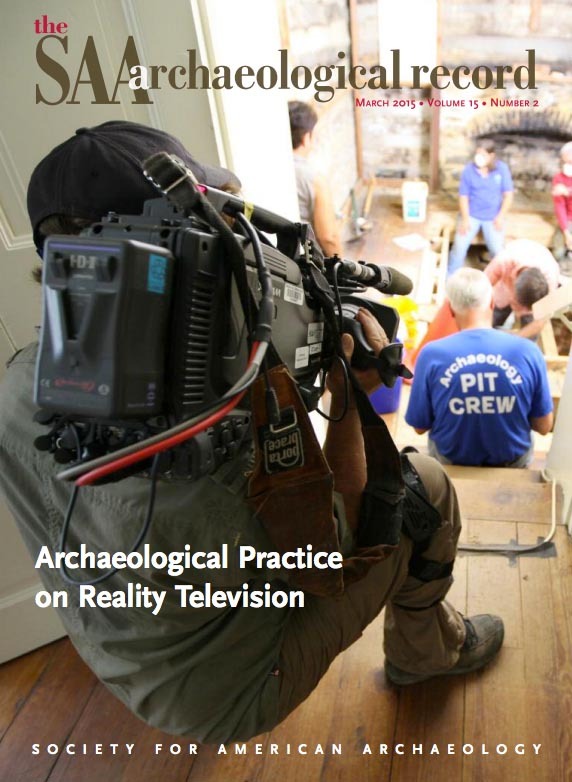 2, March 2015 contains a special section – Archaeological Practice on Reality Television – edited by my colleague and former SAA Executive Board liaison for the Public Education Committee, Sarah Herr. The “From the President” column of the issue provides an excellent introduction and context for the reality television discussion. President Jeffrey H. Altschul is to be congratulated for taking on the reality television and archaeology topic in a way that proved quite productive. Too often, our professional disciplines only become involved when our turf is directly threatened and then in a rather holier-than-thou manner. Over a multi-year period Jeff has been intimately engaged in the reality television topic. As his SAA President’s term comes to an end, he has begun to see the fruits of that work. His column details the multi-year conversations with the National Geographic Channel around their portrayal of value, broadly defined, of the material culture at archaeological sites. Jeff’s leadership in this area produced visible changes in the popular Diggers program, including the opportunity for archaeologists to comment and make recommendations on the rough cut versions of episodes. Articles by Jim Bruseth, Sarah Whitcher Kansa and Carrie Dennett discuss the economic and other implications of the SAA considering a variety of Open Access options for the organization’s journals. Sarah Herr introduces the section on reality television, providing some background for the discussion. Sarah also interviews John Francis, Vice President for Research Conservation and Exploration at National Geographic Society (NGS). Francis reviews the more than one century of NGS contributions to archaeology and specifically discusses the Diggers show and how he did not expect some of negative feedback. While agreeing to the need for substantive change in the show, he also encourages archaeologists to consider the challenge of holding an audience’s attention when reporting research and to develop an eye for storytelling. Meg Watters writes about the reality show Time Team produced for 20 years in the UK and the more recent Time Team America in the US. Meg writes that “Time Team America‘s goal is to represent the diverse archaeological resources in the United States and to address global issues such as climate change or the movement of people.” A difference with Diggers is Time Team America’s focus on archaeological methods of research at each site that are also reported online. Watters notes that the Time Team America members follow the advice of John Francis to link science and storytelling. Watters notes that the archaeologists and other researchers at the sites investigated by Time Team America report the program has a positive impact on the public support for the site research. Watters concludes that for archaeology reality shows to succeed professionals must be more than consultants but involved in program development. She sees Time Team America as beginning that process. Giovanna Peebles advocates using reality television to be part of the solution and not add to the problem. Giovanna chaired the SAA Task Force on metal detecting of archaeological sites on reality television. She notes that the “Task Force quickly identified three distinctive but related opportunities for the SAA to explore: improving communications and public education, enhancing relationships with metal detectorists, and working together with the producers of reality television shows. articles by Matthew Reeves on working with metal detectorists, Richard Pettigrew on video production, and Jeffery Hanson on creating a preservation ethic. This thematic issue of the Archaeological Record is an important read for all cultural heritage professionals and students. I am particularly pleased that the SAA charged Sarah Herr with pulling together the diverse group of experts for the issue. The volume speaks well of the SAA understanding of the need to engage with the multiple publics who through their tax dollars and other time and resource commitments make the work of cultural heritage professionals possible. 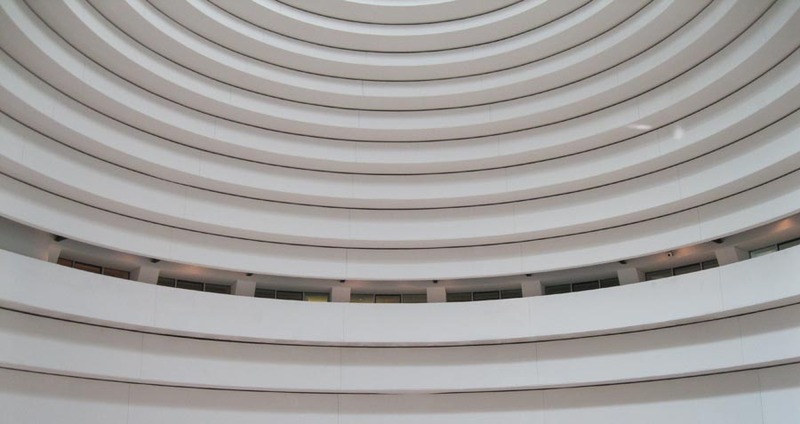 Public Access to Artifacts: A Problem or Opportunity? We are doing a major exhibit upgrade at the C.H. Nash Museum at Chucalissa. 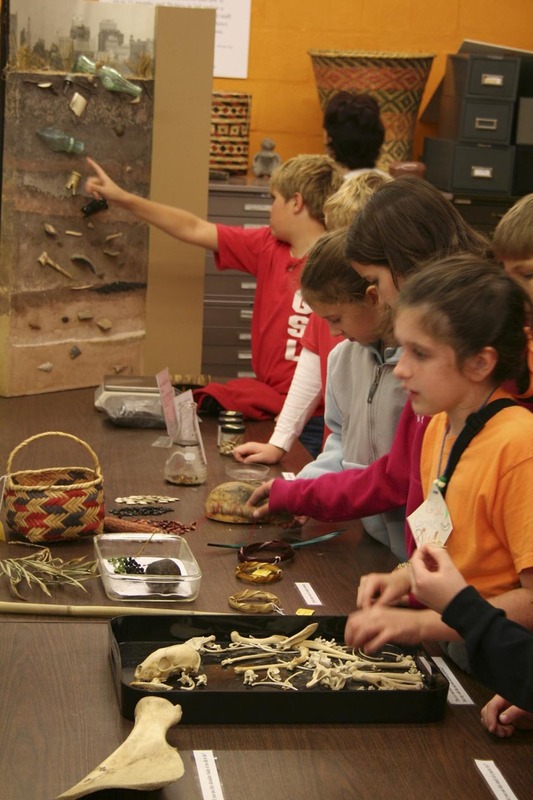 Here is a story – in the Spring of 2008 we launched our “Hands-on Archaeology Lab” drawing on some of my experiences over the years in community outreach. 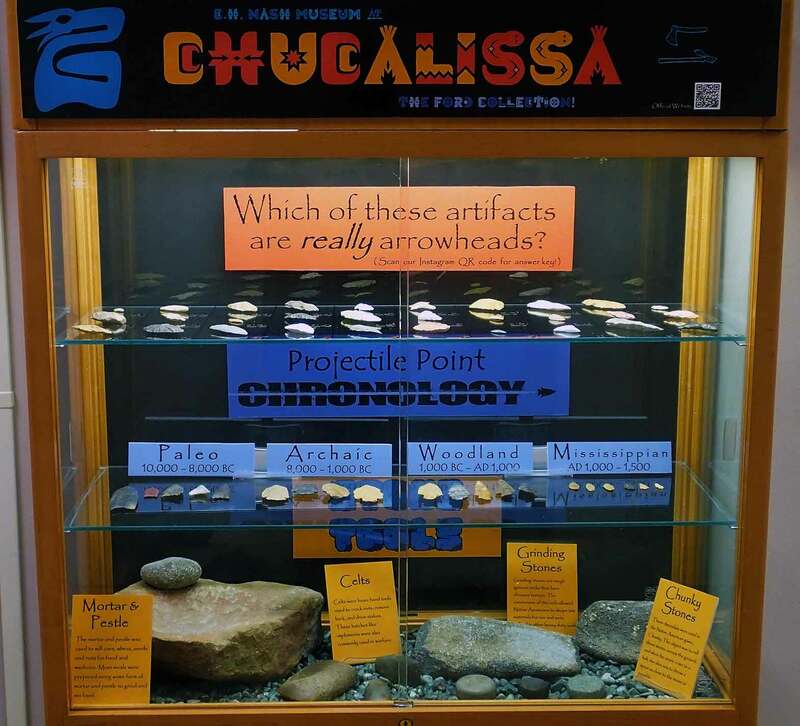 We used deaccessioned or never accessioned educational collections curated at the Chucalissa to provide visitors with a tactile/sensory experience with archaeological materials that are usually visible only behind glass. Since 2008, we have made minor changes and additions to the lab. The exhibit proved a big success based on teacher/visitor informal and formal evaluations. In 2013 we conducted focus groups and surveyed visitors and staff on what worked and what didn’t work in the Lab to decide how to improve the experience. Based on those responses we came up with a proposal to upgrade the Hands-on Archaeology Lab into the Brister Archaeology Discovery Lab (BADLab). In the fall of 2014, the River 2 AmeriCorps NCCC Team began the upgrade process. The six-person all women team gutted the lab, moved the map cases to a new location, tore out the sinks and cabinets, and laid a new floor. (River Two Team member Chelsea Crinson (who was voted NCCC Team member of the year for the Southern District Go Chelsea!) 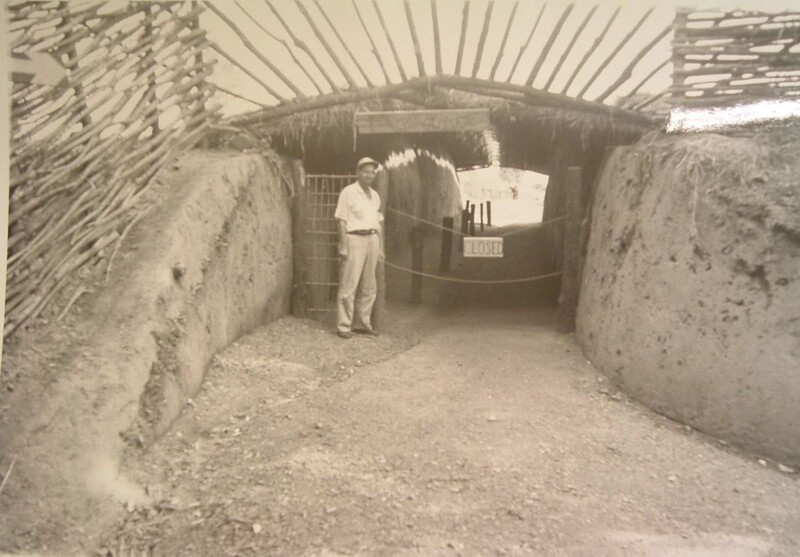 designed and supervised the painting of one wall to approximate the covered excavation trench at the Chucalissa site. For safety reasons, we no longer permit public visitation of the trench that was originally excavated in the 1950s. Our idea was to mount actual size digital images of portions of the trench (e.g., buried living floors, evidence of basket loading, postmolds,) at the appropriate locations on the wall Chelsea designed in the BADLab. Transition to BADLab with AmeriCorps painted wall trench. Then we stepped back and looked at the incredible work the AmeriCorps Team had done and began rethinking the project. Ron Brister, who first worked at Chucalissa in 1966, and for whom the renovated BADLab is named, made a suggestion – what if instead of mounting digital photographs to the BADLab trench painting, we mounted sediment peels from the actual excavation trench. In this way, we could bring the actual excavation trench into the BADLab exhibit. Ron’s suggestion got everyone thinking more. We wanted to highlight the contribution our museum could make to cultural heritage in the Memphis area that complemented but was not redundant with offerings at other venues. Bringing the excavation trench inside was one such contribution. A second opportunity was expanding the use of the thousands of unaccessioned and unprovenienced prehistoric and historic cultural artifacts we curate in our education collection. I wondered – could we use a curated educational collection in the BADLab to tell the complete story of an artifact from the field to the museum. Such a hands-on exhibit would allow us to explain the importance of provenience, the time period and function of the occupation, and so forth – and we could use a 20 foot section of wall and counter space to tell the story. I considered the Fred Jobe collection of artifacts from Lincoln County, Tennessee, that I have posted about before and how they might fill this role. Since their accessioning in 1982, these 3000 artifacts had remained in our repository unused. But since 2012, the collection has been the subject of 3 student projects, volunteer day activities and a temporary exhibit at the C.H. Nash Museum. I was particularly intrigued because the Jobe farm artifacts are reportedly collected from part of a Revolutionary War land grant. As a minor league baseball player turned farmer, the recently deceased landowner, Fred Jobe, was a human interest story to go along with the 3000 unprovenienced cultural materials he donated to Chucalissa in the 1980s. Brooke Garcia, our Graduate Assistant who works with collections noted that the Fred Jobe collection was in fact accessioned and our Collections Management Policy did not allow for accessioned collections to be used for hands-on educational exhibits. Nor did the Policy allow for the deaccessioning of materials for such purposes. Our Graduate Assistant Nur Abdalla, who worked with the Jobe artifacts and created the temporary exhibit expressed concern about the security of the collection in the BADLab. She also noted that we had offered to install the revised exhibit in the Lincoln County Museum in Fayetteville, Tennessee, near the Fred Jobe farm. The accession vs. deaccession point is important. We all agree that today, given the same information about the Fred Jobe collection we might only accept and inventory the artifacts for use in educational projects. Today, we would not accession the collection. (Without the detail, we assume that the collections are from the Fred Jobe Farm, but we do not have any direct paperwork that support that case. The filed site forms do not list the cultural materials noted on the accession forms.) We do have provisions in our Collections Management Policy to deaccession materials that do not fit our Collection Plan criteria. The Fred Jobe collection falls into this category. In fact, we have other collections that were accessioned in the 1970s and 80s with absolutely no provenience information. We could deaccession these materials as well. Related, Robert Janes considers this issue from a perspective of museums lack of sustainability in part through unlimited collections growth. Should we deaccession all such materials, including the accessioned prehistoric vessels curated in our museum with provenience information listed only as FOP (found on premises)? 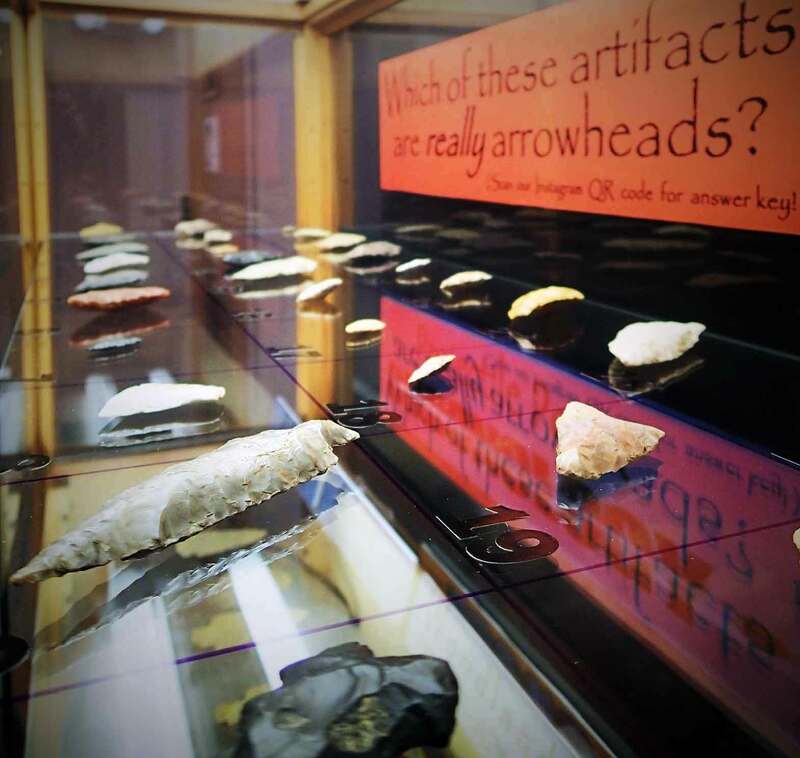 Since 2008, we are aware of perhaps 5 projectile points that have gone “missing” from the hands-on-lab exhibit. I suspect at least an equal number of ceramic sherds have been pocketed or lost. This low number is attributed to our official policy that the visitors to the hands on lab must be accompanied by a museum staff. None of the missing artifacts were accessioned or have any provenience information. We have hundreds, if not thousands, depending on artifact type, of unaccessioned/unprovenienced artifacts from our educational collections to replace the missing pieces. Is this loss a reasonable exchange for the thousands of visitors who have had a real-time tactile experience with the prehistoric materials? I am attracted to the idea of using this particular collection from the Fred Jobe farm in our upgraded BADLab because there is a compelling and relatable story to tell along with the artifacts. Alternatively, we could use other unprovenienced/unaccessioned collections to tell other stories. Should we even be using these types of collections in creating hands-on, or any other type of exhibits? I will appreciate your consideration, comments, and questions as we grapple with this issue in the coming months. For the rest of this year, we will be working on the sediment peels! Nancy Hawkins with plaque presented to her at the dedication. The World Heritage designation of Poverty Point provides an unparalleled opportunity to launch such a new direction. The 45-minutes of formal presentations at the dedication on Saturday were suitably nonpartisan and enthusiastic. The proceedings presided over by Louisiana Lieutenant Governor Jay Dardenne featured remarks by U.S. Senator Mary Landrieu and National Park Service Director Jon Jarvis. All spoke passionately about the potential the World Heritage Site designation brings for Louisiana. 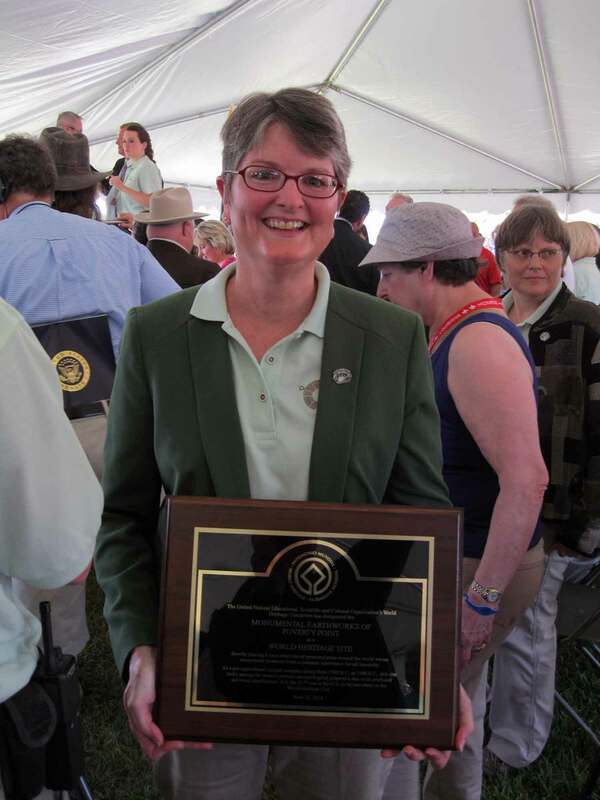 Special plaques were awarded to Nancy Hawkins of the Louisiana Division of Archaeology and Diana Greenlee, Station Archaeologist at Poverty Point to acknowledge their work in the nomination process. The politician who was and remains the most tireless and consistent champion of Poverty Point, beginning in his elementary school days, is State Senator Francis Thompson. The Senator was not on the speaker’s platform but was invited to come forward to say a few words. Thompson is a phenomenal orator who combines the best of the stereotypical fire-and-brimstone Southern preacher and politician. His few words, which of course stretched into as long as any of the featured speakers, did not disappoint. Lieutenant Governor Dardenne spoke of the last eight years in shepherding the nomination through the World Heritage Process. Senator Thompson was able to extend and personally speak to that process going back to his childhood. Nancy Hawkins and Diana Greenlee were acknowledged as the individuals who gave the Lieutentant Governor and others the raw material to even launch the process. Nancy and the late State Archaeologist Tom Eubanks were responsible for creating the Station Archaeology program at Poverty Point that ultimately allowed for Diana Greenlee to put together the nomination document. The Native American tribal affiliates in Louisiana were recognized by Dardenne. Had their ancestors not built the earthwork, Poverty Point would be long forgotten today or only the name of an obscure 19th Century Plantation. There were also a bunch of archaeologists and soil scientists present on Saturday such as Jon Gibson, Bob Neuman, Joe Saunders, Thurman Allen and others who provided the very grist for the mill that created the basis for knowing the prehistory of the place. I have posted before about the importance of folks such as avocational archaeologist Carl Alexander to the Poverty Point site. This group of archaeologists was the only set of individuals not mentioned by Dardenne or other speakers from the platform this past Saturday (save Senator Thompson’s brief sermon). Somewhat fitting to this exclusion is the state funding cuts to Louisiana’s public archaeology program. Standing with a treefall on the Poverty Point ridges that are now fully mitigated. When the celebrations die down and lawmakers get back to the business of out budget cutting each other, as seems quite fashionable in the U.S. of late, Louisiana will be faced with the hard realities of the opportunities in having the 21st World Heritage Site in North America at Poverty Point – and the opportunities will require a commitment of time, energy, and resources. The state has had some lessons in this fact over the years at Poverty Point. For example, during my tenure as Station Archaeologist back in 1997, I debated with architects about whether the planned curation facility for Poverty Point needed to be climate controlled. The architects argued that all we had up there to put in the facility were a bunch of “rocks and those clay cooking balls.” In a similar way, the World Heritage Site status necessitated the Office of State Parks dealing with the issue of treefalls on the Poverty Point ridges and mounds. 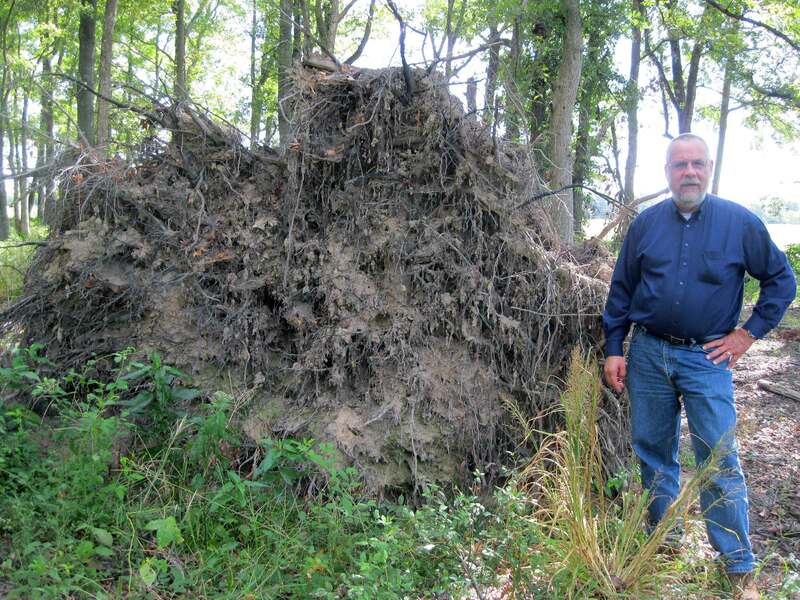 The exposed root mass of a single treefall typically exposed thousands of prehistoric artifacts and cultural features. Back in 1997, the state considered mitigating these events as a waste of resources. Ultimately, establishing best practices in both of these issues clearly were preconditions for the World Heritage Site designation. If the proclamations from the podium this past Saturday of the tens of thousands of international travelers who will be flocking to view this new World Heritage site are true, then the museum and interpretive facility will need dramatic upgrades. For the most part, museum exhibits remain unchanged from their initial installations in the 1970s and certainly do not include the extensive research program that has taken place over the last 40 years on which the World Heritage Site nomination was largely based. In addition to Poverty Point, the past twenty years research by archaeologists such as Joe Saunders at the Middle Archaic Watson Brake site, arguably the earliest example of monumental architecture in North America, complements the Poverty Point site. Watson Brake is just some 50 miles as the crow flies from Poverty Point. The tourism and cultural heritage bump provided by the World Heritage Site designation at Poverty Point could be used as a true launching pad for the region. The opportunities for the private and public development of the region are outstanding. The state of Louisiana can continue on the trajectory that led to the World Heritage designation and truly organize the resources to bring the interpretive potential of Poverty Point to the World Heritage Site status for which it is now recognized, along with an abundance of other earthwork complexes in northeast Louisiana spanning over 4000 years of prehistory. This can be the new direction that public archaeology takes in Louisiana and can serve too as a model for the nation as well. 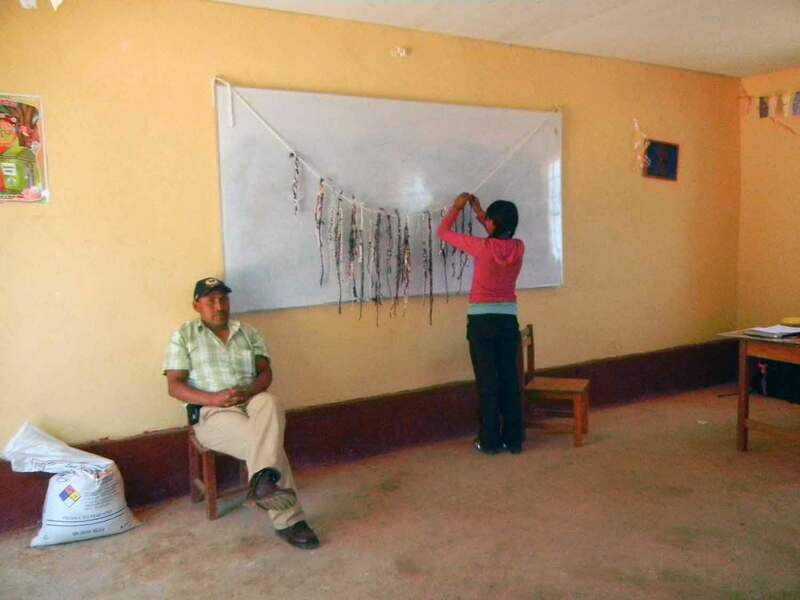 Student adding her string to the class quipu as their History Professor Leodan Abanto Alejo Valerio looks on. I just read a volume of papers on creativity in museums, visitor experiences, and so forth. Despite the plethora of measurement outcomes for visitors touching pieces, engaging with staff, talking among themselves, voting for their favorites, and so forth, I found no mention of a visitor being asked “what are your needs and wants from this institution.” That is, the papers reflected what professionals determined as an appropriate set of goals and then a set of measures of how well the visitor experience achieved those goals. The papers reflect the trend that to prioritize the visitor experience is often simply making a decision to value the visitor on an equal or greater level than the object. The museum staff then generate a set of proposals on how this engagement might occur. This approach seems the antithesis of John Cotton Dana’s 1917 mandate in The New Museum to “Learn what aid the community needs: fit the museum to those needs.” Explicit in this mandate is engaging directly with the community to determine those needs. I had a couple of interesting lessons recently on Dana’s point. I previously posted how an article published on the engagement between the Southwest Memphis community and the C.H. Nash Museum along with printed banners honoring military veterans were highly valued by the community members. In conjunction with faculty from the University of Memphis, this summer our Museum conducted another round of oral history interviews that will be archived at southwestmemphis.com. The important point about these projects is that they resulted from the expressed needs of community members. I emphasize here that I do not mean to take a holier-than-thou position on our community outreach. I am consistently surprised at which projects resonate with the community. But through experience, I am coming more and more to act on the direct community input at the very start of project development. We then filter the community input through the mandates of our museum mission statement. 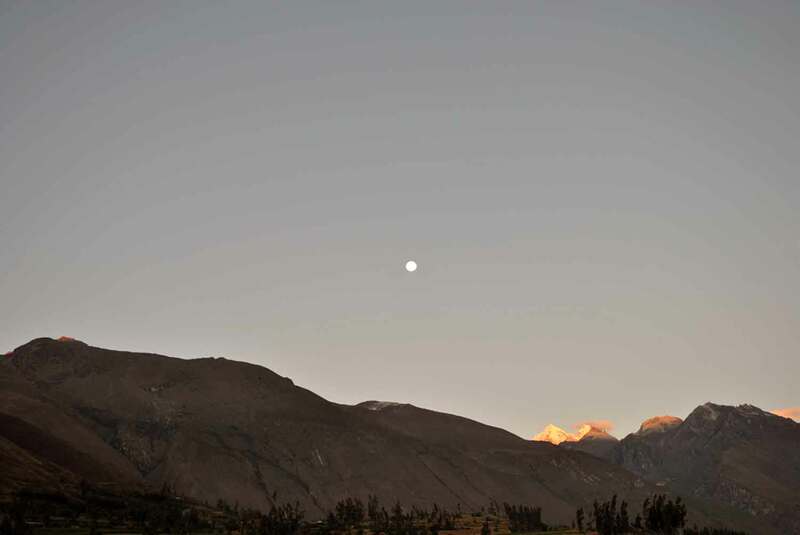 This process holds true in my recent collaborations in Hualcayán, Peru. On the PIARA Team, my primary responsibility this summer is beginning the process for the development of a cultural center or museum for the small village of 400, a 2-hour drive on an unpaved road from the next larger community. To that end, I have scoured the literature on small indigenous museums and cultural centers for models and have found very few. One of the better resources is Sustainable Cultural Tourism: Small Scale Solutions by Susan M. Guyette, a rather encyclopedic approach to the concept. Last year I asked Rebecca Bria, the founder and co-director of PIARA, if the Hualcayán community really wanted a museum or were they really more interested in economic, educational, and health care development. She emphatically responded that through her five-year engagement with the community, they expressed that a museum, a physical structure to showcase their heritage was a primary need. Rebecca’s assessment came through quite clear in the discussion with the Hualcayán teachers I posted about last week. The teachers want a written record of Hualcayán generated. Another example of meeting a community expressed need came last week in a classroom project with Hualcayán high school students carried out by Karissa Deiter and Hannah McAllister. They adapted the quipu exercise from Archaeologyland for this project. After introducing the importance of artifacts in telling the stories of the past, Karissa and Hannah used quipus as an example of how past societies recorded information. Each student then created their own quipu string that recorded their age, numbers of siblings, and so forth. The project was originally designed so that each student would create their own quipu, yet the teacher and students decided that the individual strings would be tied to a unified class quipu. Minimally, the quipu will live on at the school and ideally will become in “artifact” in the community’s museum set to open on August 2nd. After the quipu demonstration, the history teacher decided that the next project was to develop a timeline of the entire Hualcayán community. To that end Karissa and other members of the PIARA team will lead the high school students on a tour of the archaeological site, the research lab, and more. As I noted in last week’s post, from the very inception, the in-class presentations developed for this summer in Hualcayán were based on the previously expressed needs of the teachers and community. The PIARA team put together projects that were then modified and further developed on the spot by the community members. Ultimately, the product is tailored to the needs of the visitor/student/community member and not the museum. This approach strikes me as a method that emphasizes a bottom-up method for co-creation. What are your experiences with this type of co-creation process? Hualcayán students in line for Santa Cruz Anniversary Parade. For the past 24 hours of this Day of Archaeology I spent the early morning in Caraz, Peru where I had arrived the night before after a 24-hour plane/bus trip from Memphis, Tennessee, US via Lima, Peru. I will be in Peru for the next month or so collaborating on several projects (cultural heritage and education development, lithic analysis of excavated materials from the Hualcayán archaeological site) as part of the Proyecto de Investigación Arqueológico Regional Ancash (PIARA) Team. After breakfast at the La Terraza in Caraz, changing money, and marketing for supplies, my colleagues Elizabeth Cruzado Carranza, Co-Director of PIARA and Caroline Havrilla, a PhD student in the Biology Department at the University of Colorado rode to the village of Huaripampa for the Anniversary of the District of Santa Cruz celebration. 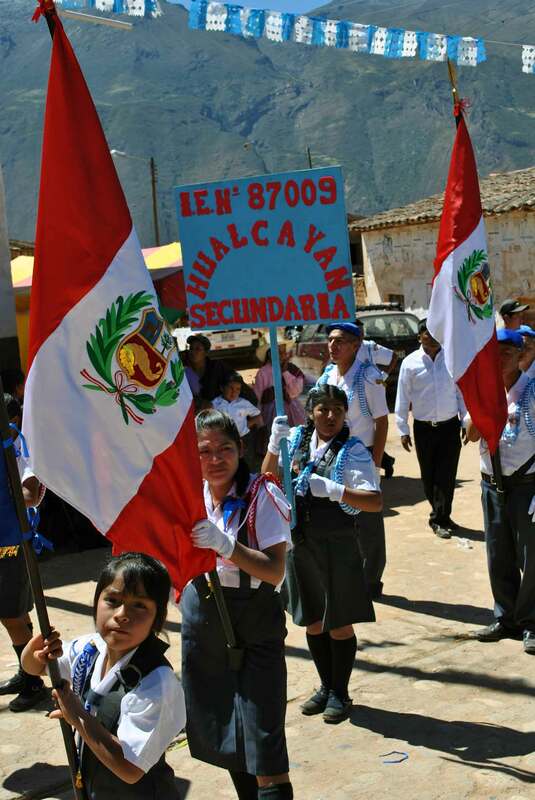 Besides the opportunity to watch a parade, something that happens here in Peru and in New Orleans U.S., with equal regularity, we came to cheer on the students and faculty of the Hualcayán school in their participation in the celebration. 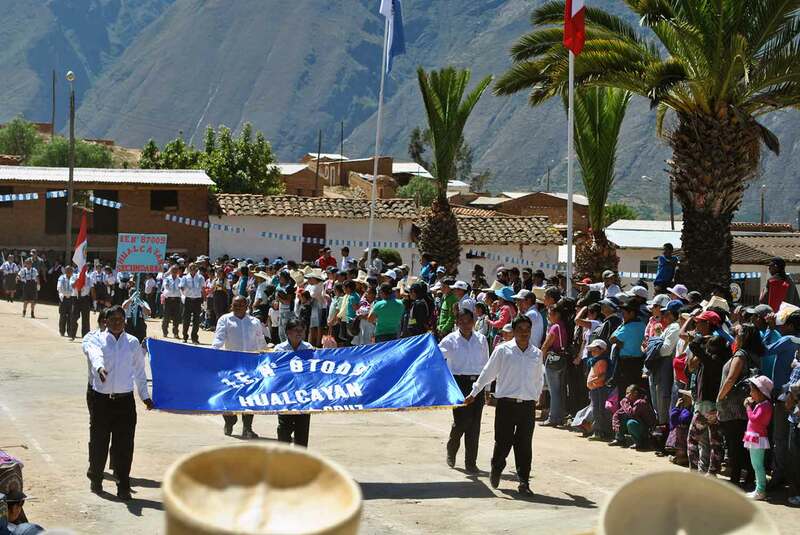 PIARA is active with the local Hualcayán school in the village of 400 (here are some details). This year we adapted several of the programs from the Archaeologyland on the Society for American Archaeology website and also archaeological presentations for student group visits to the C.H. Nash Museum at Chucalissa where I serve as Director. Elizabeth got a phone call that my one piece of luggage lost in transit had been found and would make it to Caraz in the next couple of days. I was quite relieved as all of the archaeological educational materials I brought were in that luggage. Hualcayan parade banner carried by the school teachers. After the celebration we rode back to Caraz, had lunch, did some more marketing, and then visited the Municipal Museum in Caraz. Elizabeth has been quite active with the Museum since its inception and last year organized an exhibit on the past five years of research at Hualcayán. Carlos, the lead staff person at the Museum. Besides seeing what was new in the exhibit since visiting last year, Elizabeth and I wanted to set up meetings with museum representatives to discuss a Museum Connect grant possibility with the Chucalissa Museum. The Museum Connect grants are facilitated through the American Alliance of Museum as true collaborations and equal partnerships between a U.S. museum and an institution outside the U.S. This perspective fits very well with PIARA’s approach to applied archaeology. We made arrangements with Carlos to return just before the July 22nd re-opening of the Museum to further discuss the possibilities. After a bit more shopping for supplies, PIARA Co-Director Rebecca Bria arrived from Huaraz and we all prepared for the two-hour ride up the road to Hualcayán. We had a great conversation as Rebecca filled us in her recent 7-day trek with the American Science Climbers Program and a PIARA team. The trek surveyed some higher elevations in the Province recording information relevant to global warming and unrecorded archaeological sites. We arrived in Hualcayán as the sun set. I spent the rest of the evening unpacking, catching up with folks and getting ready for tomorrow. I enjoy that today was a fantastic mix of activities in how I have come to envision applied archaeology. A full moon as we arrive to Hualcayán. This past Saturday temperatures in Memphis were in the upper 90s to insure a pretty light turn out for our regular Volunteer Day activities at the C.H. Nash Museum at Chucalissa – especially since we advertised a focus for the month on outdoor landscaping and gardening. In the end, we had a great day. 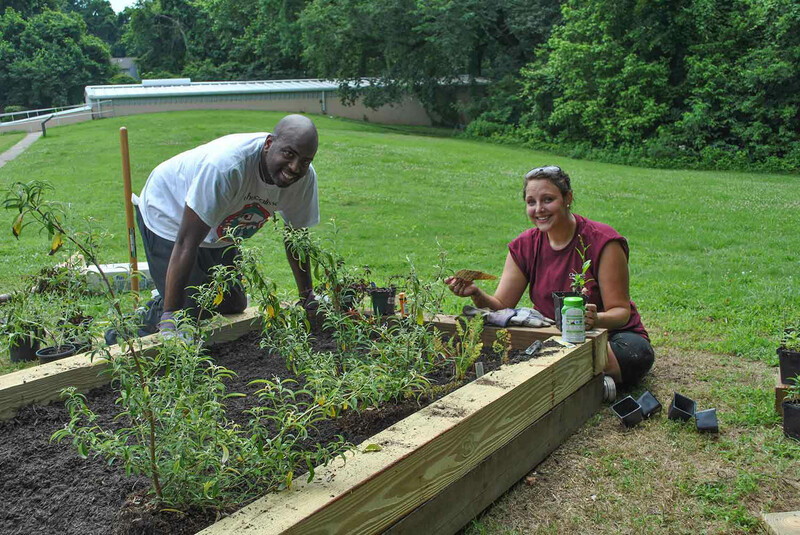 Carmello Burks and Rachel Clark planting the Butterfly Garden. First, Rachel Clark from my Applied Archaeology and Museums class this past semester had proposed that we install a butterfly garden in the area that in Chucalissa’s pre-NAGPRA days housed the display of human remains excavated from the site. Over the past few weeks Rachel and I discussed the sensitive logistics for the proposed installation. The garden could not intrude below the ground surface in any way, given the very real possibility of remaining human burials in the vicinity. We also discussed installing a panel on a nearby kiosk to explain why the human burials were no longer exhibited at Chucalissa. A butterfly garden and informational display on the importance of NAGPRA and respecting the lives of those who built the 1000 year-old Native American earthwork complex seemed fitting and in line with the wishes of site development expressed by contemporary Native Americans of the Midsouth. Second, on Saturday we also made arrangements for an Eagle Scout Project that will replace a dilapidated bridge along our nature trail. Eagle Scout projects are always a negotiated process, matching our museums’ needs with the ability, interest, and motivation of the individual Scout in tandem with Eagle project criteria. The bridge was in desperate need of replacement and the Scout chose the project from a half-dozen possibilities. Third, on Saturday members of the Westwood Neighborhood Association were out to tend the urban garden they planted for the third consecutive year. The idea for the garden came from an offhand comment by a community member during a focus group on exhibit hall upgrades for our museum. 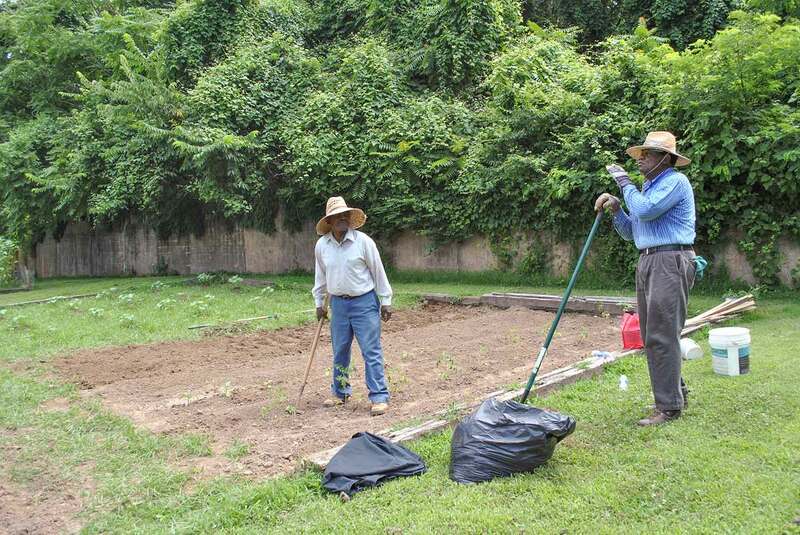 One community member, the recently deceased Mr. Ralph Thompson, noted that the prehistoric agriculture exhibit at Chucalissa reminded him of traditional foods grown in his youth. He lamented the lack of a suitable public space for such a garden today. We immediately noted that we had 40 acres of protected space to consider for an urban garden, and the project took off. The garden is a source of pride for many community members. The participants this past Saturday, Mr. Robert Gurley and Rev. George Royal told me about how good it is for the body and soul just to get out in the sun and do physical labor. The urban garden produced a bountiful harvest in the past two years shared throughout the community. 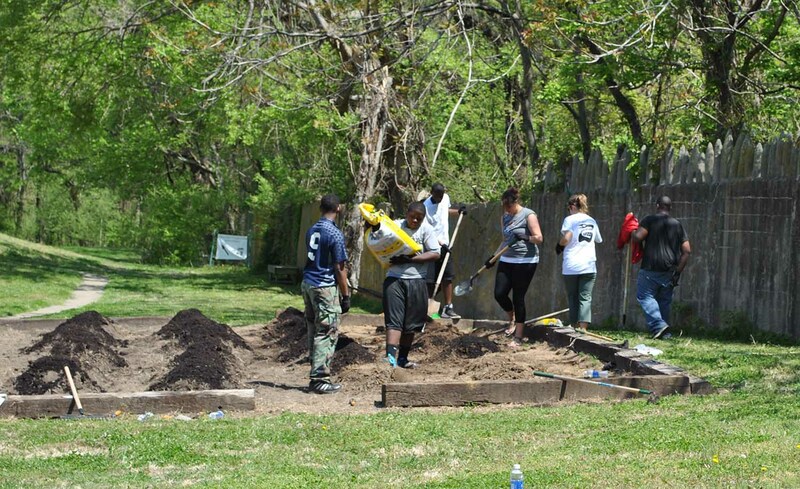 Freedom Prep Students creating hills for the Three Sisters Garden on Earth Day in April. Fourth, I was itching to spend the day out in the heat and humidity. I am one of those folks where the temperature and humidity never get too high. I spent the morning weeding in our Three Sisters garden, planted in individual hills typical of Native American cultures in the late prehistoric period. The plan for the garden was originally designed by Carrie Havrilla as a Green Internship project at the University of Memphis. 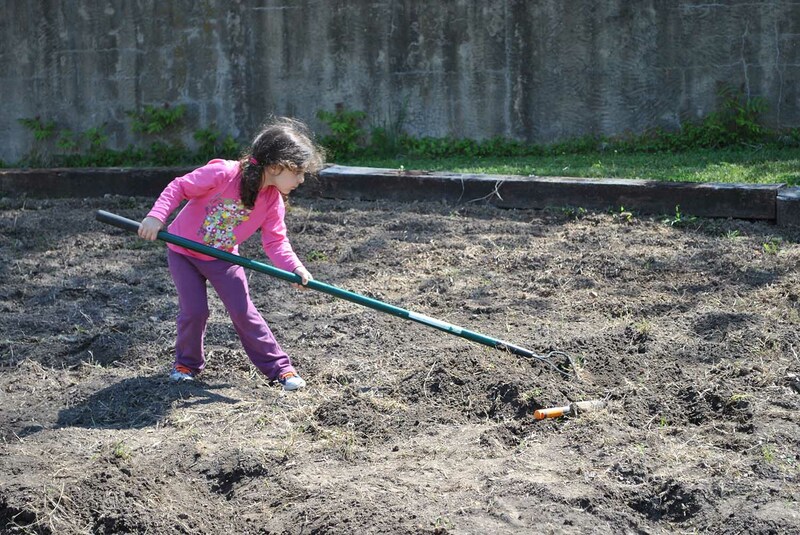 This year we planted the garden as an April Earth Day activity with community members and families taking responsibility for individual hills. Fifteen students from Freedom Prep Academy, a local charter school, also participated in sculpting the hills and planting the corn, beans, and squash. I recently posted about my course Applied Archaeology and Museums and some of the student projects from the class. Below are two more student projects of a different type. Rachel Clark created a Wikispace page for the Museum Studies Graduate Certificate Program at the University of Memphis. The purpose of the page is to serve as a place to post about internships, jobs, and general information related to the Program – all areas that students expressed a need for more information. The Wikispace page will rely on student input for added information and maintenance. This makes sense as the information is primarily intended to support student interests and needs. Area museums seeking interns or job applicants can also post to the Wikispace. The idea for the project floated around for a couple of years until a student took the responsibility to act. Rachel conducted a series of interviews and surveys with her peers in the Program to decide appropriate content. She also met with each faculty member in the Program to get their buy-in. The page Rachael created is typical for Wikispace in being stylistically simple but with much data content. The WikiSpace page will be promoted on the Museum Studies Program homepage as a student based project. The WikiSpace page is also an experiment in user-generated content for the Program. If the page is truly relevant to faculty, students, alumni, museum professionals, they will use, edit, and support the page. If not, the page will go the way of the original Friendster. Rachel has performed the first step in creating the framework based on peer and faculty survey and interview results. Jordan Goss, a sophomore in History, conducted a survey and wrote a report on the public support and interest for a cultural heritage venue in her hometown of Marion, Arkansas. Jordan did a particularly impressive job with the project. She started the semester proposing to create an exhibit in the town high school on the cultural heritage of the area. Jordan was challenged with questions such as: Does anyone besides you want the exhibit? Is the high school the best place for such an exhibit? What will be the content of the exhibit? She then decided to shift the focus of her project from creating an exhibit to determining the interest and feasibility for such an exhibit. With guidance from Bernard’s Research Methods in Anthropology she created a survey. She loaded the survey on Qualtrics (think Survey Monkey on steroids) for which she has free access as a University of Memphis student. She promoted the survey through social media, mailed copies, and in person. She also conducted semi-structured interviews with key stakeholders in Marion. Finally she submitted and completed an Institutional Review Board proposal to conduct the surveys. the recommended site and type of exhibit/presentation. how the respondents envision funding a center. An impressive set of initial of data! Jordan is currently administering the survey to a broader audience. In the fall semester, Jordan will create a formal proposal based on her survey results. Jordan’s survey work is a an excellent first step to determine the feasibility of a cultural heritage center in Marion, Arkansas. As with all the other student projects from this semester, Katie and Jordan’s were able to make real-time contributions to area cultural heritage venues. At this point 10 of the 12 projects are actively in place for use in area institutions. Katie and Jordan’s projects each relied extensively on survey results from the intended users of their products. We stress this point often in the class – the need for project relevance for the intended users. In both cases, the feedback and buy-in of the anticipated users markedly changed the initial direction of the project. As Katie and Jordan developed their projects, they were aware of the distinct possibility that their end products might not be used. The WikiSpace page might be ignored by the intended audience. Marion, Arkansas may never have a cultural heritage center or museum. However, both students believe that they have taken the correct first steps toward creating a viable finished product. I agree. So ends another year of student projects that result in products with real-time applications in area museums! Stone Tool Exhibit created by Garrett Ballard and Rachel Starks in Johnson Hall at the University of Memphis. A prompt I gave for a possible project was a near empty exhibit case in the classroom building where many archaeology classes occur. I noted the C.H. Nash Museum at Chucalissa curated an abundance of unprovenienced stone tools in our educational collections that could be used in creating an exhibit for the case. Two students, Garrett Ballard and Rachael Starks, proposed and created a stone tool exhibit that explored function and stylistic changes through time. The exhibit has three shelves. 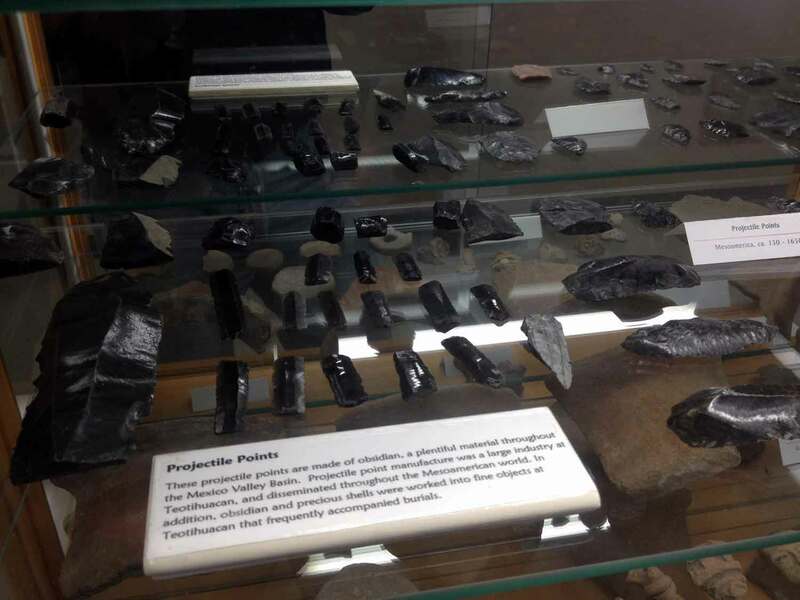 One shelf of their exhibit contains projectile points ranging from Paleoindian through Mississippian. Individual artifact labels include the age of the artifact and a linked QR code contains interpretive information. One shelf contains a series of untyped but numbered bifaces with a single label that asks “Which of the artifacts are really arrowheads?” the popularly assigned term for any triangular-shaped stone tool. A QR code links to a resource that illustrates and explains the function of each tool and identifies the true arrowheads. The third shelf contains a set of ground stone tools and labels that contain functional and raw material information. Numbered bifaces in the arrowhead identification shelf of the exhibit. The students pulled the stone tools from an unprovenienced surface collection curated at the Museum. Robert Ford, a University of Memphis Alum, and the best lawyer in a one lawyer town in rural Arkansas donated the collection in 2000. Ford donated the collection for use in educational projects. The several thousand diagnostic stone tools that range from Clovis to Mississippian points remained untouched in the repository for over 10 years. Mr. Ford was not pleased and called me one day asking about the artifacts. Having come to the museum seven years after the donation was made, I was unaware of the donation. When I located the materials in the repository, we made quick work of utilizing them in several of our educational programs. 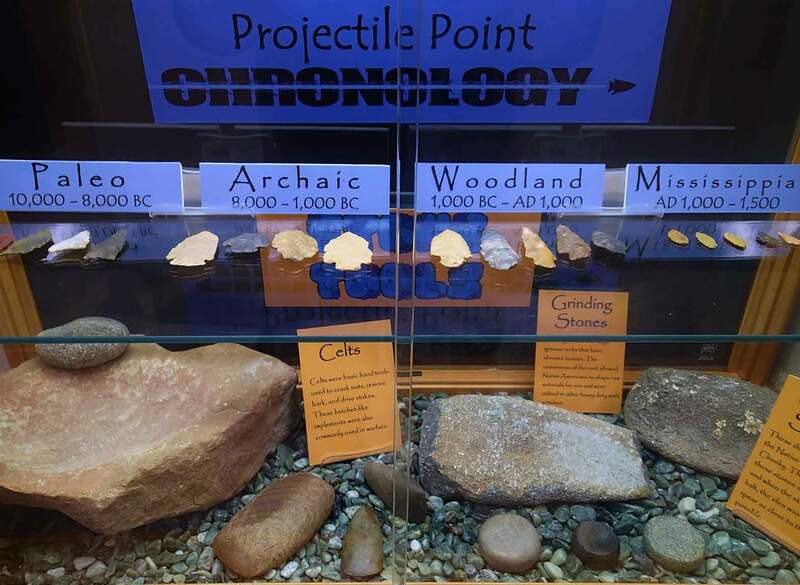 Projectile Point chronology and ground stone shelves of the exhibit case. Besides physically creating the exhibit, there are a few key lessons the two students gained from the project. First, they took away a keen understanding of the value and potential of archaeological resources locked away in museum repositories. Second, as undergraduates they created an exhibit that is of interest to them and their peers. Third, they created a meaningful product that will live on after the semester is over – an act in itself that is empowering. Ultimately, we all had common interests and decided to pursue a common goal that would satisfy all the parties involved; I would get to create an exhibit using authentic Native American projectile points, Rachel would get to incorporate website design, social media, and QR codes, you (Connolly) would get a Chucalissa exhibit installed at Johnson Hall, and lastly, Robert Ford’s artifacts would get plenty of educational use through our exhibit . . . I was slightly overwhelmed by the number of artifacts in the collection, and was very concerned about how I would manage to convey a message to the viewers of the exhibit. Luckily, I believed you sensed my frustration and sent me the Serrell Reading to help. Serrell’s guide has been critical in our research design, and has helped me not only to make better interpretive labels and an overall comprehensive exhibit, but it also showed me the importance of having a “Big Idea”. Armed with a “Big Idea” and a fresh delivered copy of Noel D. Justice’s Stone Age Spear and Arrow Points, the next few visits to the repository proved to be enjoyable and result driven as the project was coming together and pieces started to fall into place . . . While going through the collection I took care in the handling, photographing, and cataloguing of a range of different types of tools and projectile points, increasing my own knowledge on the subject matter in the process. A point reinforced to me is that in such projects, my role is to provide logistical expertise and guidance, but allow the students creativity to come to the fore. In so doing, they arrived at concepts, such as the Which is an Arrowhead . . . shelf that likely would not have occurred had I dominated the process. When given such latitude, I find students enjoy the freedom, but also experience an initial sense of frustration as Garrett notes. However, with guidance, students work creatively to find solutions and directions. I would not have chosen the colors or fonts that Garrett and Rachel used for the exhibit. But then, their peer group are the primary audience for the exhibit, not me. Stone tool portion of exhibit created by Michelle Faulk. Michelle Dallas Faulk organized and created didactic panels for an exhibit of ceramic sherds and obsidian tools from central Mexico. 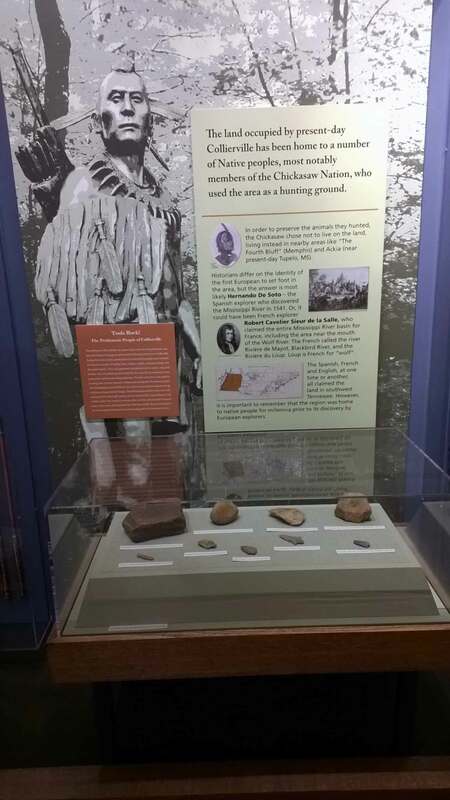 The exhibit is located in the same hallway as the Stone Tool display created by Garrett and Rachel. 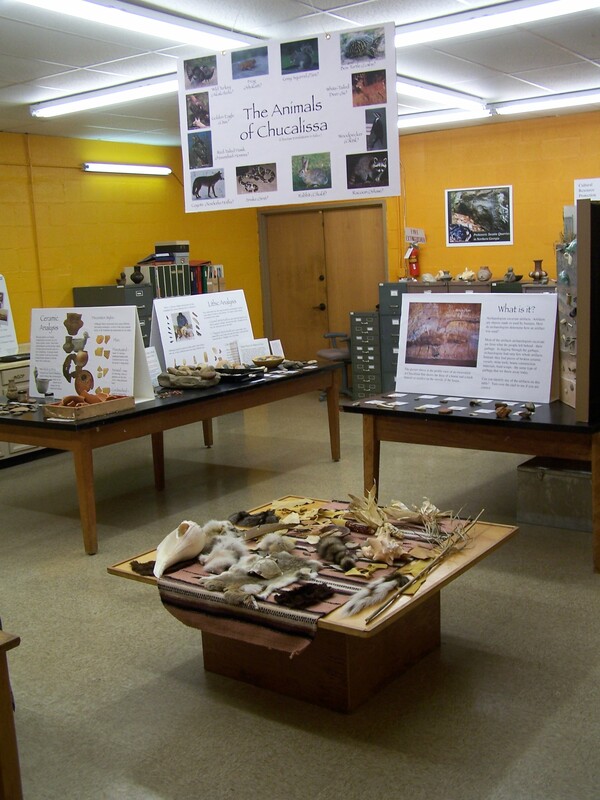 Prehistory exhibit for Morton Museum created by Carolyn Trimble (does not include large back panel). artifacts in our repository from two prehistoric Collierville sites excavated through Cultural Resource Management projects. A QR code link reports the sites and contextualizes the prehistory of the suburb for museum visitors. In next week’s post I will report on other types of student projects created in the Applied Archaeology and Museum class from this past semester.